Contr. U.S. Natl. Herb. xii. 427 (1909). 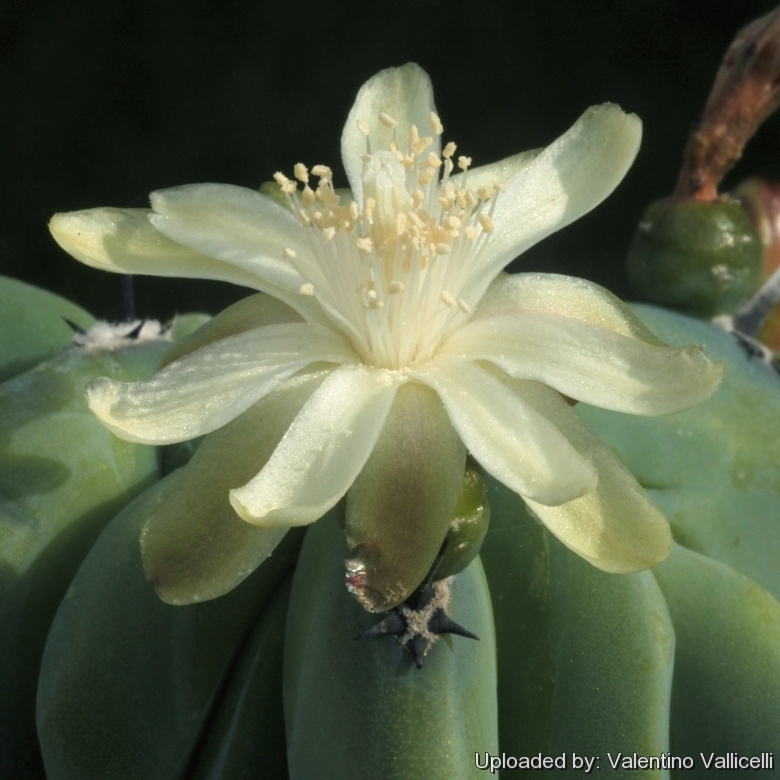 Origin and Habitat: The cactus is endemic to the Baja California peninsula of Mexico. Habitat and ecology: It grows on hillsides on almost the whole length of the peninsula, where it is locally common on hillsides and mesas, but in the northern half it is confined to the eastern Pacific slopes where it receives winter rain, while in the southern half it is found on the western side, with summer rains. The tiny greenish-white flowers attract insects and birds, especially hummingbirds, as pollinators. Myrtillocactus cochal f. cristata hort. Description: It is a large sprawling shrub or small tree with many compact, candelabra-like branches from a short woody trunk, 1,5-4 m in diameter and 1-4 metres tall. 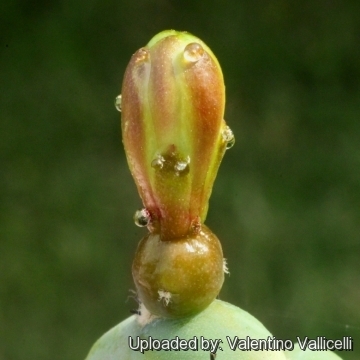 It is occasionally grown in pots but is less common in cultivation than the very similar but more frost-tolerant Myrtillocactus geometrizans. It lives only a few decades. Stem: Trunk short, woody up to 30(-40) cm in diameter. The branches are slender, all nearly uniform in size up to 9 cm in diameter, erect or recurved inward in graceful arcs toward the centre of the plant, generally bluish-green in colour and have 6-8 obtuse ribs separated by shallow intervals. Central spine: 0 to 1 longer greyish to black up to 2 cm long. Radial spines: 5, shorter of the same colour 5-15 mm long. flowers: Nocturnal and diurnal (closing late in the morning when temperatures raises), scented, 2,5 cm long and in diameter. Tepals, oblong, few (about 16) yellowish-cream to light green, the outer ones often tinged purple; filaments white; stygma lobes 5-6 white. Blooming season: In habitat plants flower throughout the year, while plants cultivated in temperate climate usually flower only during the favourable growing season mainly in early summer. Fruit: Edible, spineless , red often tinged yellow or brown, juicy, slightly acidic, globular 12-18 mm in diameter which look and are used like currants. Cultivation and Propagation: They are not hardy, make sure that your Myrtillocactus are not exposed to freezing temperatures or they may die, nevertheless it is a good advice never let the nighttimes temperatures fall below 10°C. Water regularly in summer but allow to dry fully before watering again. Need a well-drained soil mix with small gravel added to ensure drainage.. During the winter months they should be rather kept dry and water is restricted to only enough to keep the stems and branches from shrivelling. Since they are big sized plants need plenty of space for their roots, repotting should be done every other year or when the plant has outgrown its pot. Exposure: Light shade when young, full sun later.